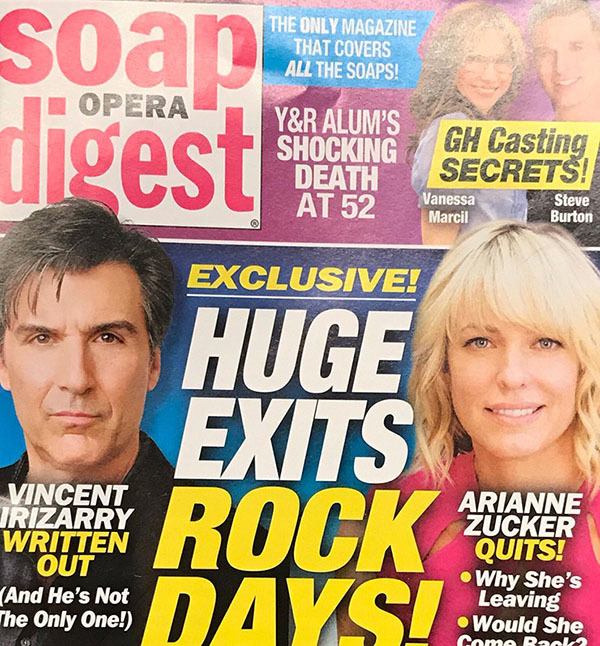 Soap Opera Digest broke the zinger about Zucker today. When her contract expires in April, Zucker says she will not renew, reported Soap Opera Digest (SOD). The full story appears in SOD’s upcoming issue, on sale Friday. Of course, if Zucker tapes her last scenes in April, that means she’ll still be on the show until October, as the NBC sudser tapes episodes six months in advance of when they air. Zucker has been at the center of the Days story canvas for years now, embroiled in a host of intense storylines. Some notable recent scandalous stories she’s been a part of include Daniel’s death, her relationship with Deimos (Vincent Irizarry), and Holly’s custody battle. Perhaps the fallout from her devastation at losing baby Holly will be part of her swan song storyline. Zucker has played flawed but fabulous Salem heroine Nicole Walker for 17 years full of tears, laughter, and soap opera wackiness. This is daytime, folks. Nothing is impossible, as we know and love about our soaps. No matter how Nicole leaves the show, the door is always–and you know we mean always–open for her return. For more on this Salem stunner, check back with Soap Cities often. Previous ArticleUPDATE on Scott Reeves Medical Condition–Good News! I’m a relative newcomer to Days, but in the 4-5 years I’ve been watching, I have come to appreciate Nicole/Arianne so much! I rarely FF any of her scenes…and THAT’s saying something since I am the queen of FFing! She will be missed, but since Deimos is leaving, and since I’m one of the few (?) who liked those two together, this is probably a good time to go. Maybe they’ll leave together? Anyhoo, this is sad news indeed!